Now that the emotions and feelings have settled I would like to provide a short feedback regarding my experience with Santosha. 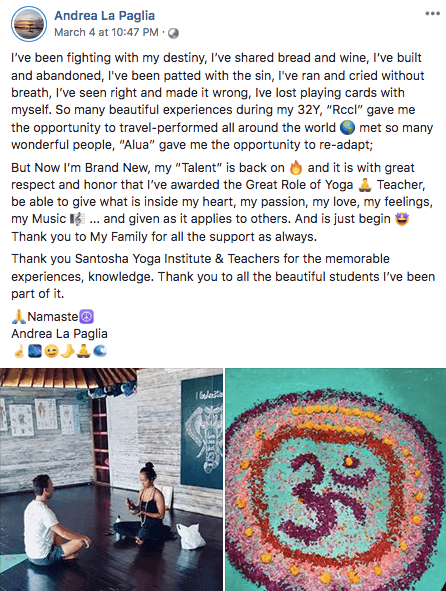 The entire course was amazing… I found this course to be a unity of all the factors required to become a good yoga teacher. Teachers Team – very dedicated, kind and knowledgeable people. They presented the materials, postures and classes in a interesting and captivating way. I have learnt a lot from Ana Lu, Thia, Megan, Sebastian and Jono – and observed their different teaching styles. I want to thank all of them for sharing their personal experiences with us because there was always a new experience or thought to take back home. Course elements – the textbooks provided were easy to read and understand and the assignments were clear and specific. I liked that the written/ practical assignments were designed to promote the goals of the course. 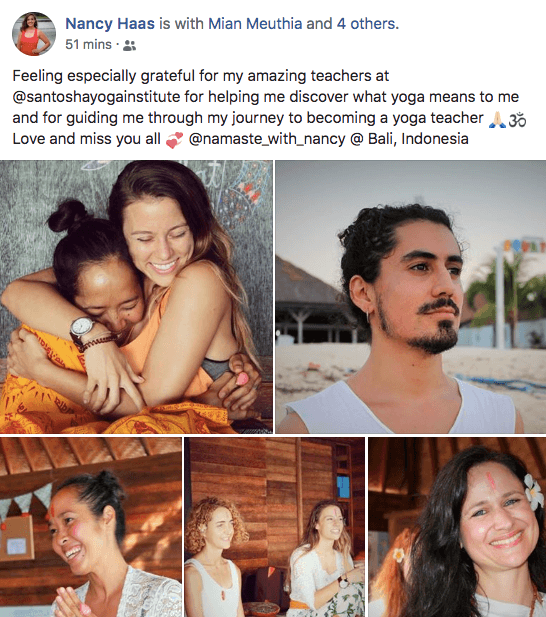 The teachers created for all of us a nurturing, meaningful and joyful environment – I have learned, experienced, teach, cry and laugh and everything was amazing and gave me the confidence and the example of how to become a good yoga teacher. 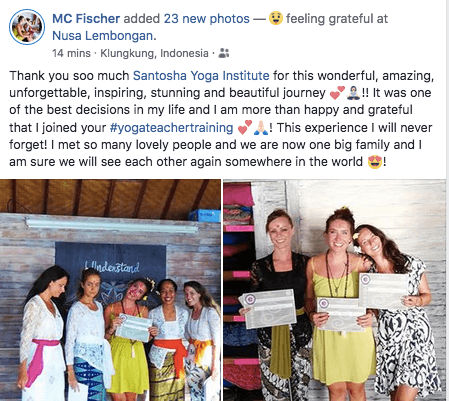 The way in which the entire course was taught gave me the confidence to have yoga classes with my first students without emotions or stress – I felt relaxed , enthusiast and happy to share what I learned with them! 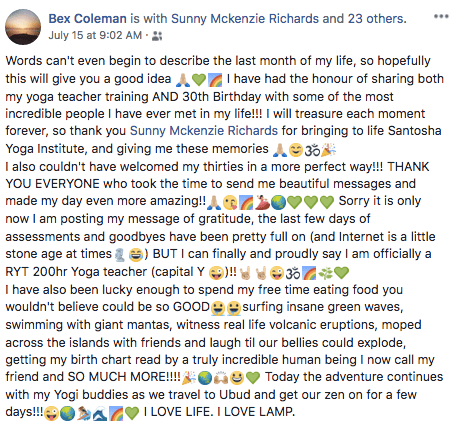 I completed my Level 1 YTT over Sept/Oct 2018 and I could have never imagined it to be so captivating and transformative. The month was absolutely life changing and 100% the most cathartic experience of my life. I feel so blessed and honoured to have had the opportunity. I felt like each aspect of the day was so well rounded and for the first time in my life.. assessments and lectures were an enjoyable experience. You have built a beautiful community in Nusa Lembongan and it truly felt like home. I met some beautiful lifelong friends that I still keep in contact with. One of the most extraordinary and significant parts of this experience were the teachers, the content they taught and how they made me feel. Thia’s presence, understanding and unconditional love was so powerful from the very beginning. I felt her energy from the very first time I walked up the stairs into the shala. She set the tone for the whole experience. Thia is this radiant light that makes everyone feel so special. Her passion for Yoga, her guidance and her support made this experience something I will never forget. Andrea’s deep knowledge and love for Yoga was evident throughout her classes. I learnt so much from her. She was remarkably caring and kind. Andrea always put the students first and went out of her way to help, regardless of what time it was. I am so grateful to have been in her classes and I feel so privileged to have had her as a teacher/mentor. Megan was so gentle, humble and friendly. She had a wealth of knowledge and was so present in every class. She showed up to every class with a smile on her face. The stories she shared were captivating and I really enjoyed learning from her. I am so appreciative for her help and feedback during the final assessments. Sebastian was charismatic and fascinating. I got lost in his words. The way in which he taught philosophy was extremely thought provoking and powerful. I took a lot of things away from his classes and I still share and refer to the things he said. Joanna was always so welcoming and friendly. I enjoyed the pre/post natal class with her and I loved learning from someone who was once a student of Santosha. I think you are so incredibly lucky to have a team of such dedicated, driven, extraordinary teachers and I feel so privileged to have learned from the absolute best. I could not recommend Santosha enough. Thank you for creating something that changed my life. Just wanted to reach out to you and say how much I’m enjoying the course. All the teachers and students are amazing, it’s been such a wonderful journey so far and I’m looking forward to the weeks ahead! What you’ve created here is beautiful, you should be super proud! To use a metaphor, it feels as though Santosha has been baking the same cake for a long time and gradually refining the recipe and ingredients to create something beautiful. I’m sure it’s ever-evolving, and I just wanted you to know that I feel that I am learning so organically. I am retaining knowledge easily, and information from the various subjects is integrated perfectly. This is leading me to feel confident in my learnings and teachings. Thia, Sebastian, Johanna, Jaime and Andrea are beautiful souls with such good intentions. Their passion and dedication is infectious and inspiring, they are living examples of what they teach and have been nothing short of amazing. I am experiencing so much positive growth and transformation on a physical, emotional, mental and spiritual level. I’ve been on a bit of a beautiful healing journey prior to arriving in Santosha and it feels as though this is exactly what I need to consolidate and expand upon my previous learnings. The beautiful journey of life, my heart is radiating love and I’m so grateful for this experience. I’m exactly where I’m supposed to me and I’m so proud of myself for trusting my intuition about Santosha. This place feels like home, both Lembongan and Santosha, and it feels as though this is the start of a life-long love affair… It’s great there is another male in Luke for support, and I’m also embracing the opportunity to get to know a beautiful group of like-minded women and developing platonic relationships with them. It’s doing wonders for my feminine side in a world where women are so often objectified, and I’m so grateful for this opportunity. As a surfer I’m loving being able to surf where possible, as a fellow surfer I’m sure you can relate. Whilst at times it can be challenge to see those perfect rights at Shipwrecks rolling through from the shala, this wave is probably my greatest teacher. It’s a reminder to honour my choices and intentions for undertaking this course and be present, and I’m getting so much joy from this process. I couldn’t be happier spending my days learning about yoga as a system, the main reason I chose this course is because it focuses on the eight limbs. I fell in love with yoga about a year ago and knew there is so much more to it than I was aware that was making me feel so amazing. I came here to explore that and deepen my practice and it’s such a beautiful and life-changing journey already. I feel like I’ll be back to do my Level 2 next year once I’ve put my learnings into practice and integrate the knowledge I’ve gained. Sunny!!!! I just have to reach out to you and thank you so deeply and with so much love for creating such an incredible space for everyone to exist in. I cannot actually put in to words how I feel as I feel it on a much deeper and sensorial level…. I feel so much of your love shining through your beautiful teachers, and I know you and see you so deeply through them. I have been living in a world not so different to the one you have facilitated , but it has just been such a blessing to witness some seriously incredible transformations, and to have the opportunity to really delve in to that part of myself as well. This course has truly been above and beyond what I allowed myself to imagine. Please let me know if you are ever teaching at one of your courses, or are teaching anywhere in the world, as I would absolutely come again just to meet you. – What did you enjoy about your time of the training? Finding out more about myself, my personality and yoga. I loved learning more about the deeper meaning of yoga and integrating more of this in my daily life and in my teachings. – What was the best thing about being in Nusa Lembongan? Nusa Lembongan is the perfect place to do the YTT. I always called the island my ‘yoga bubble’ as it is far away from the hectic main island Bali and the many tourists, the locals are super chilled and friendly and you find amazing places to eat healthy, do yoga and go for a surf. Not to mention the amazingly stunning beaches and the crystal clear water. – What will you take away from your time on the Santosha YTT? I loved getting to know amazing people and learning the different aspects of yoga. – What would you say to someone thinking of joining us on this course? Be prepared for the most intense 4 weeks of your life that will change you for sure! It is a lifetime experience that I would not want to miss for my life! The Santosha 200 hr YTT was a truly transformative time for me. It was lovely to be around such an amazing group of students and also surrounded by the most inspiring kind teachers, I feel truly blessed to have been apart of the course. Nusa has this crazy chilled vibe, its like being in a community, the locals and people on the island are always happy and helpful and every corner you turn is another slice of paradise. I have taken all my learnings with me, for both being a yoga teacher and also for myself. Go and do it will be one of the best decisions you will ever make. 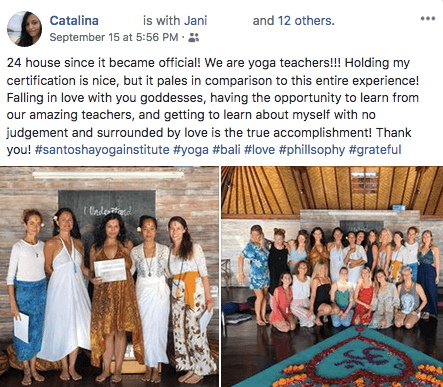 “I feel incredibly blessed to have come across Sunny and Santosha in 2012, and to have had the amazing opportunity to attend the YTT course in Canggu, Bali. The course provided a life-changing education that is difficult to put into words, leading to a calmer and more centred attitude to life. Even four months on, I draw on the lessons learned each day-with the knowledge of asana being just the tip of the iceberg. The amazing people are what makes this course a truly beautiful experience. Each participant is embraced as an individual, rather than another number, as can be the case in other programs. “It’s been several months now since I completed my YTT with Sunny, and it was one of the greatest experiences I’ve ever had. I’d lived a boy’s own early life, at various times raced karts then cars, briefly flown aeroplanes, run and worked cattle in the bush, stalked game, camped rough and partied hard, an unconscious but ‘fun’ life, all the while chasing selfish needs, desires and experiences. My time sitting a Santosha YTT easily surpassed it all. Sunny and her fantastic teachers have huge, open hearts, teaching a thorough syllabus in a compassionate environment. Such a loving and open space was held by our teachers, it made it easy for us as students to open, stay open and be present, soaking it all in as well as having lots of fun, laughs and the most amazing time! I’ve come away with a more thorough understanding of, and confidence to teach asana safely and appropriately, my rudimentary knowledge of anatomy and yoga philosophy have been greatly improved, I’ve learnt about other aspects of yoga I wasn’t really aware of and I’ve discovered an extended family I just hadn’t met yet. I’ve acquired new tools for teaching that aren’t limited to the mat, as well as learning much, much more about myself and how we relate to each other. At various times I was challenged, humbled and stimulated, confronted, conflicted and all the while embraced everything. Things bubbled out of nowhere, feelings and emotions I didn’t realise I contained or could still access emerged. My body coursed with chemicals I didn’t even know it could produce, all the while enjoying the support of my wonderful classmates and beautiful teachers. Shaucha, Santosha, Tapas, Swadyaha, Ishwara-pranidhana. For me these are the greatest of gifts, difficult, beautiful, incredible changes that started during our YTT and continue to evolve, their positive influence reverberating and touching all those around me. This is the real gift of yoga. Arrive with an open heart and a child’s mind. Be willingly led wherever the four weeks take you and the rewards can be sublime. Thank you Sunny and all my wonderful teachers and beautiful classmates, your incredible openness, teachings and support have had a far greater influence than any of you realise. 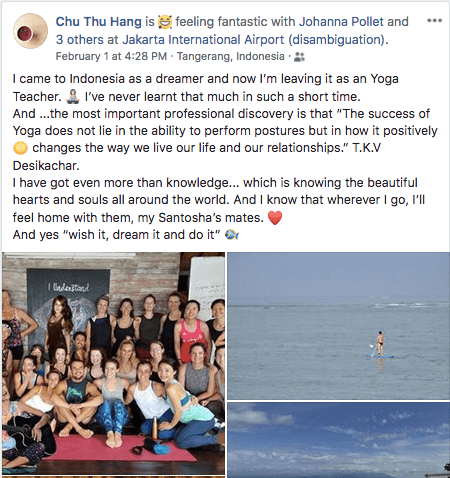 “It’s been just over a month since I returned from my journey to Bali to become a Yoga Teacher. My journey turned into so much more than that. There is something special about taking yourself away from your regular world and dropping onto a tropical island to take your YTT – I highly recommend it! There is truly nothing like it, and it allows you to completely surrender to the teaching when you open your heart to it. From the moment I stepped foot in the Shala I knew that I was in exactly the place I was to be in that moment. Being surrounded by people that are on journeys themselves causes you to become close with them very quickly. I was so honoured to share this journey with them, and so happy that I chose to do it at Santosha. This was the best place to be, for so many reasons. The training received comes from the heart, and each instructor comes with a heart full of love for yoga, and love for the individuals they are teaching. We were led back to the original intent of yoga – that it is for everyone – for healing and for growth. Santosha leads the training with the guiding principles of Yamas and Niyamas and guides the students to live with these at the forefront of our practice and our lives. I have left Bali a richer and more mindful person. A person with a different outlook on life. 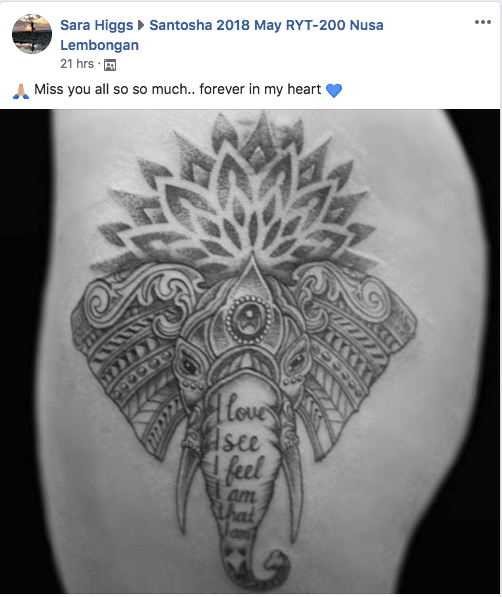 A life that is challenging me to remain present in each moment and to take this outlook and the confidence I now have as a Yoga Teacher to share this gift that was given to me with others. “At first, yoga seemed so out of my reach. For people living with persistent pain like myself, getting out of bed is tough. Becoming a yoga instructor seemed laughable. In my head, I was so intimidated. But my heart told me otherwise. Coming to Santosha has changed my life. If you live with chronic pain, I have three words for you: GO. DO. IT. I walked away with the same heart and a completely different body. Thanks to Sunny, Peter and the rest of Santosha teaching team, I am free from the pain I have been experiencing for years. “Undoubtably the most enlightening and profound yoga experiences that I have ever had. This programme gave me the opportunity to learn from a range of incredibly insightful teachers and philosophers whose beauty and knowledge was shared in abundance. The teachers on this programme have the ability to have you live and feel yoga from moment to moment. Inside of that process you can’t help but look inward to see who you want to be as a teacher of yoga and how that impacts other people. 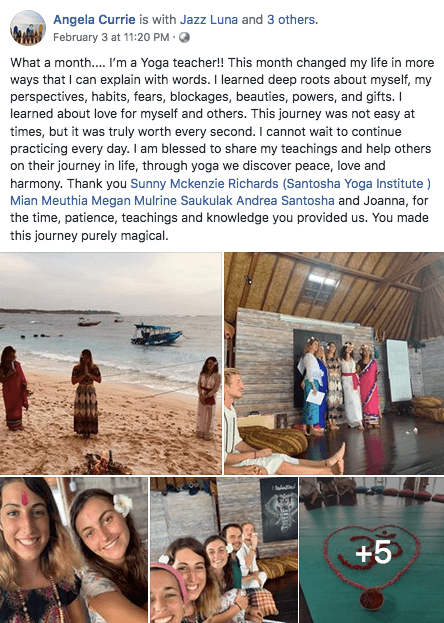 “Last November I made a life changing decision to sign up for the Santosha Yoga Online Teacher Training Course. Having practiced yoga for more than ten years I had the urge to share my passion with others. Being a school teacher, I know how many young people suffer from stress and anxiety due to modern life’s pressures. 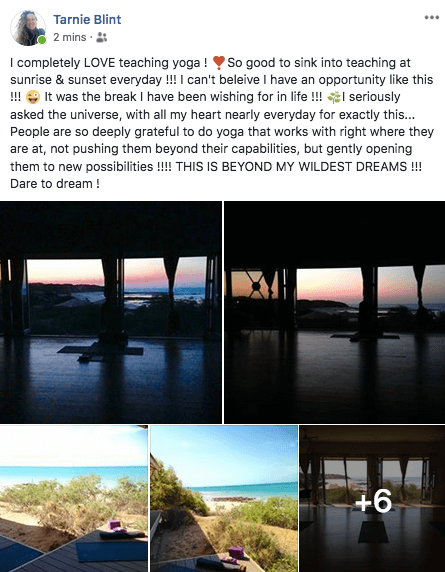 I hoped that by completing a yoga teacher course I could introduce yoga to the school as part of a well-being program so all could benefit as I have. I could not wait to get started and once I received the books and modules I began to work on the assignments. I tackled the variety of assignments from blogs, to essays, to writing scripts to making anatomical drawings with much enthusiasm, as I knew I was closer to my goal of becoming a yoga teacher. The course was very thorough, covering many key aspects including the history of yoga, Chakras and Ayurveda. I enjoyed the challenge of the assignments, some more daunting than others, particularly writing the script for a full lesson. I managed my time working on yoga assignments during weekends and accelerating through modules during school holidays. With tenacity and determination I completed it all. “Six months ago, I made the decision that I needed to make Yoga a bigger part of my life. “I felt really supported from the first moment of the course. I contacted Sunny many times during the application and had so many questions… and Sunny was always there to help me. It was a challenging course but the supportive learning environment was so great. The teachers were amazing and there for us, giving us love every moment, teaching us what yoga really means. They are dedicated to the students and helped us all to understand the subject, to feel with our body, and mind…. After the YTT, I felt confident about teaching and humbled by it at the same time. Doing this course has inspired me to further my yoga studies. The teachers inspired me to learn more and to enhance my own practice and my teaching skills. “I’d like to express my gratitude for all the support from the teachers and students of my Santosha training, who are like my family now. I was worried about who I would be roomed with and having such intense yoga lessons. Everyone’s smile really helped me through. Sunny, thank you so much for your beautiful smile. I love how you use easy English and some Japanese and use your body language so expressively. Thanks to such an open-hearted teacher. You gave me so much energy. Santosha Song from Santosha Yoga Experiences on Vimeo. Ready to begin your own transformational journey? Find out more about our Santosha Level 1 RYT-200 Yoga Teacher Training here. Find out more about our Santosha Level 2 RYT-500 Yoga Teacher Training here. Not sure which course to choose? Read more here! Listed below are a few Santosha graduates that have made themselves available to inquiries about their Santosha training experience. We invite you to contact our referees if you would like an experiential perspective of a Santosha course, but please respect their time. Please see our Santosha Yoga Teacher Directory to see where our past student’s dreams and hard work have taken them!